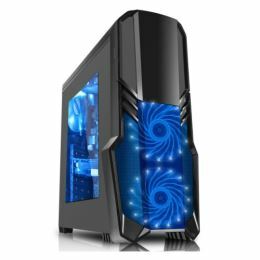 The G-Force is a midi tower gaming case with combination metal mesh / semi transparent front panel and a plastic front door makes this different to other models. The two 120mm 15 LED front fans and 1 x 120mm 4 LED rear fan, give the G-Force the case a unique style, whilst keeping the system cool. With the ability to install up to 7 x 120mm fans (3 included), or up to 5 fans and a water cooling kit with a 240mm raditor (which can be positioned at either the front or the top of the case), the G-Force should keep even the most demanding gaming system cool.